What some first thought a rumor is actually true: Two LCU students are running a local coffee shop AND a Christian radio station. Two years ago,s Thomas Herrara and Makayla Floresz were conducting Bible studies for families in Lubbock who needed support and esomeone to talk to. For Thomas, a sophomore Criminal Justice major from Lubbock, and Mckayla, a sophomore Pre-Med major from Lubbock, the studies were a way to give back to the community. But they wanted to do more. The pair found so much joy in the studies that they decided to find a way to reach more people. They came up with the idea to take over an existing Lubbock radio station. A year later, they expanded the operation to include a coffee shop. The radio station was playing country music before Thomas and Makayla took it over. The first order of business was to change the musical genre of the station. They launched “Walk by Faith Radio” to play top-of-the-charts Christian music. The station also showcases the music of local artists, conducting interviews on the talk radio side of the operation. The radio station gave Thomas and Makayla a great way to support Lubbock, with uplifting music and the discovery of new, of local artists. But soon, it wasn’t enough. A year after taking over the airwaves, they decided to build a coffee shop in the building which houses the radio station. He-Brews Coffee opened in September. Along with the clever name, Thomas and Mckayla want the coffee shop to be a friendly place where anyone is welcome. The shop is truly locally owned and operated in every sense. Thomas and Makaylaa seem to care deeply about the people in Lubbock and the needs of those people. It shows in everything they do, from hosting local comedians to playing new local artists’ music in their coffee shop and on Walk by Faith Radio. Their mission is also reflected by the friendly feel in their décor. The coffee shop space has an industrial look while at the same time feeling very homie. A large bulletin board displays customers’ friendly messages and inspiring quotes. Details such as this separate He-Brews from the franchise coffee shops. Not to mention they were also going to school. He-Brews Coffee and Walk by Faith Radio constantly conduct events and promotions to help local artists and give customers entertainment with their coffee. Local musicians play live, as well as comedians and other performers. 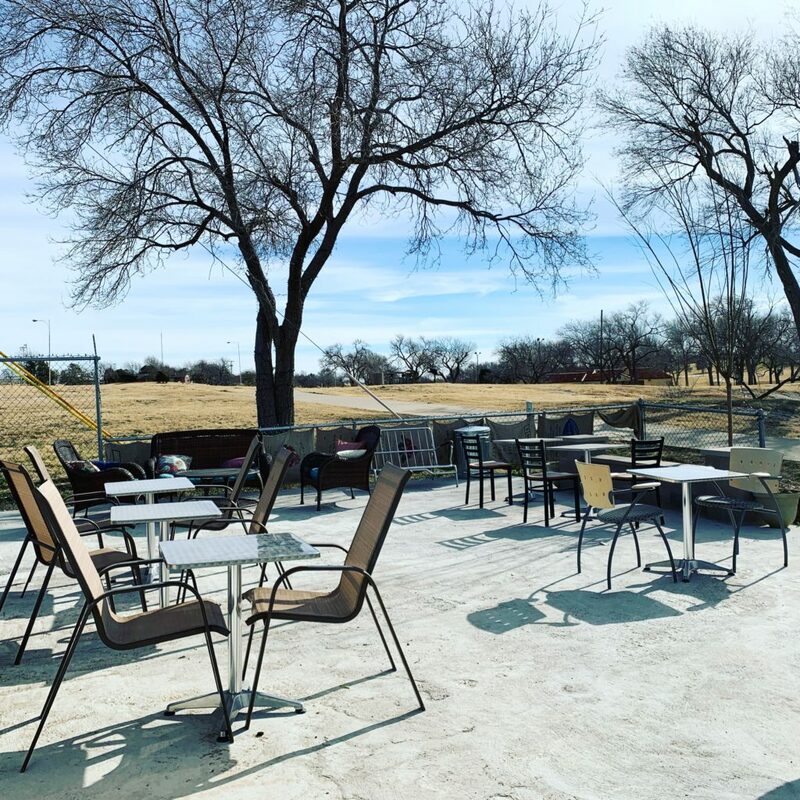 Situated in the Canyon Lakes park of Lubbock, just west of North University Ave., the building has a back porch open in the warmer months where customers can hang out and drink coffee and listen to live performances. This spring, they plan to offer kayaks and canoes for rent to take on the lake. If you want to help Thomas and Makayla or have any questions about He-Brews Coffee or Walk by Faith Radio, follow the links below. To listen to Walk by Faith Radio, go to FM 98.7 or AM 1420.